Home » Everything Else » Pop Rocks! Pop Rocks! Pop Rocks! Ahh, the silent killer Pop Rocks. The candy that theoretically will KILL you if eat them while you drink a Coke. Guess what? They won’t. Even worse, they won’t taste good either. My sis in law bought a box of these this weekend, so of course I put my hand out for a taste of the watermelon flavor. 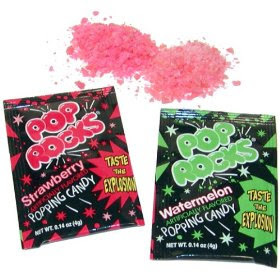 I suppose as a kid that the experience of pop rocks would be fun, and in fact, I remember that I used to like them way back when. Now though….it was just a messy, bland, exploding novelty. The green colored rocks started deteriorating immediately on my (apparently clammy) palm. That was kinda gross, as only half the rocks came off my hand and into my mouth. Yuck. The rocks that DID make their way into my pie hole were met with a lackluster reception. Yeah, they popped, but….that’s it. They don’t taste particularly good, it’s only about the pop. Now that I really think about it, maybe I’m being too harsh on the rocks. They have their place, sure. But for me, I’d take a Zots over these any day-great flavor, fizzy powder, tangy taste….but most of all, really good flavor. Pop rocks are for kids, period. But JUST for shits and grins- pick up a pack and a sixer of coke and sit out on the street. Pour the entire pack in your mouth, then shotgun the Coke. See what happens!If you’re old enough to read this, you’re too old for Pop Rocks. I’m reasonably certain your stomach explodes. That’s what happens.